Description: Brazos Bend State Park is less than an hour away from busy downtown Houston, Texas, but it feels like it's a whole different world. 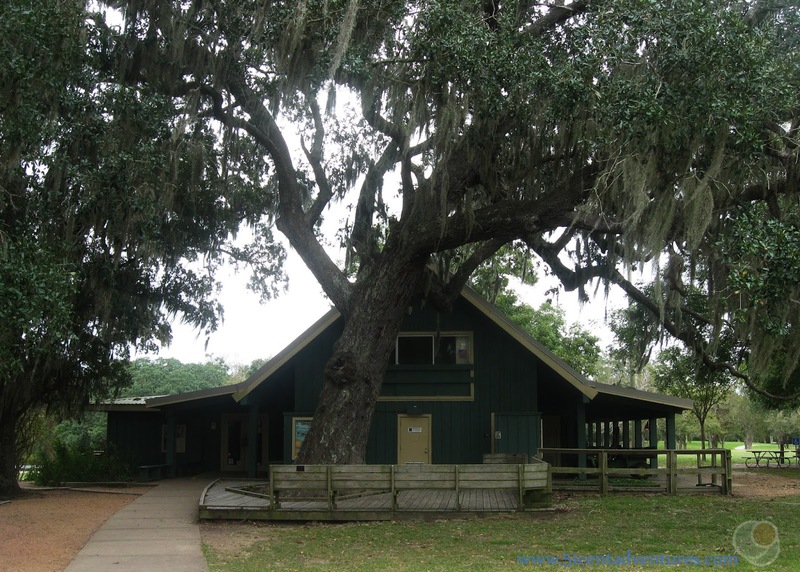 The park's 5000 acres are home to wildlife such as many species of deer and birds as well as alligators who roam free through some areas of the park. 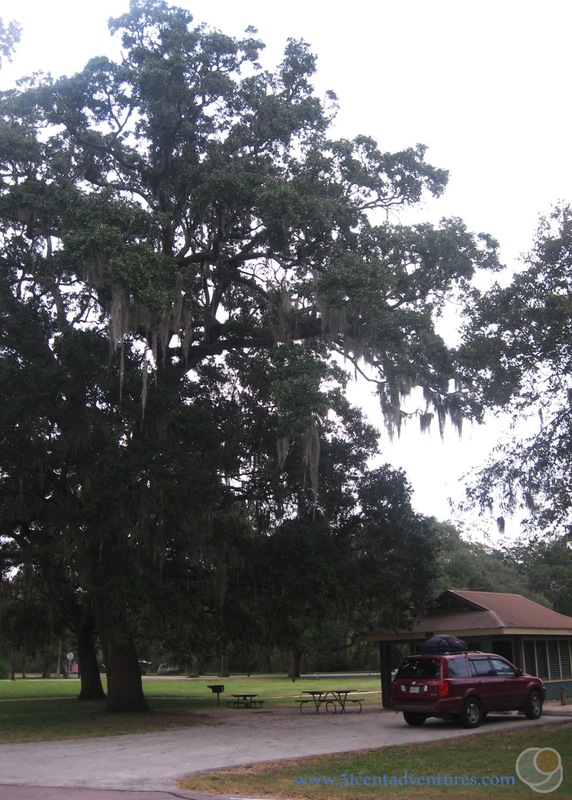 In addition to the animals, the park is full of large Live Oak Trees practically dripping with Spanish Moss. 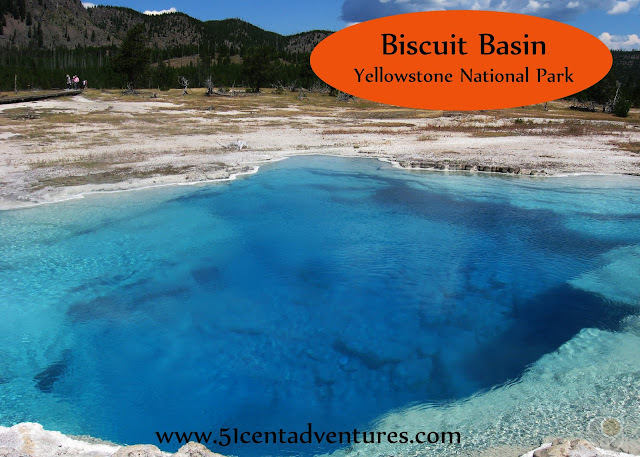 Water is abundant in the park with six lakes and numerous wetland areas. 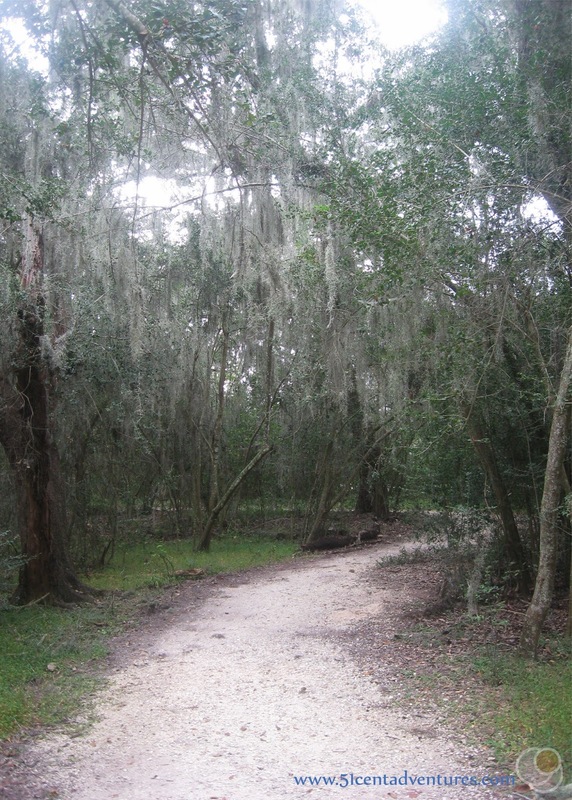 Hiking trails cover the park and allow visitors the chance to see nature up close. There is a camping area with sites for tents and RVs as well as an area with shelters. 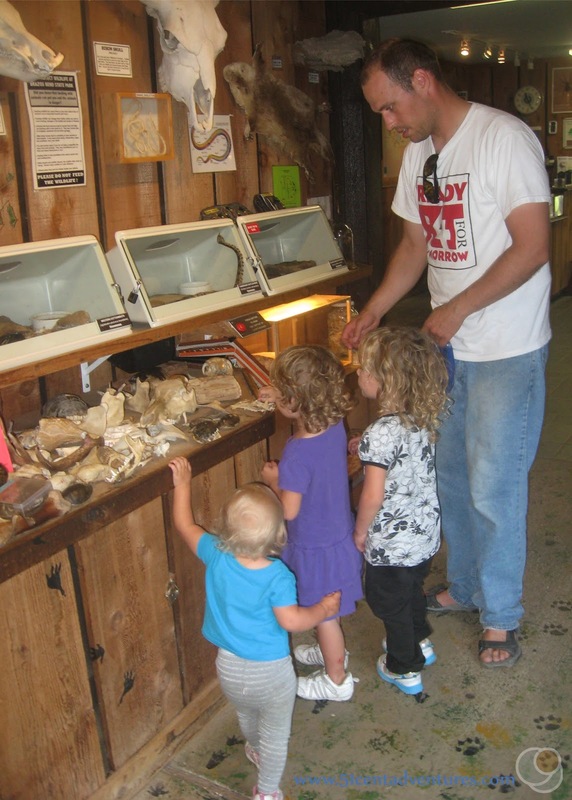 A Nature Center allows visitors to learn more about all the plants and animals in the area. 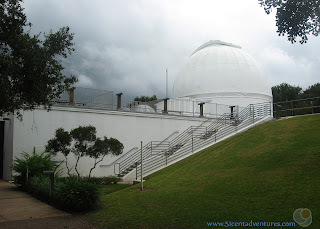 As if all that wasn't enough there is also an observatory in the park. Cost: $7 per adult. Children 12 and under are free. Admission is included in the Annual Texas State Parks Pass that is $70. 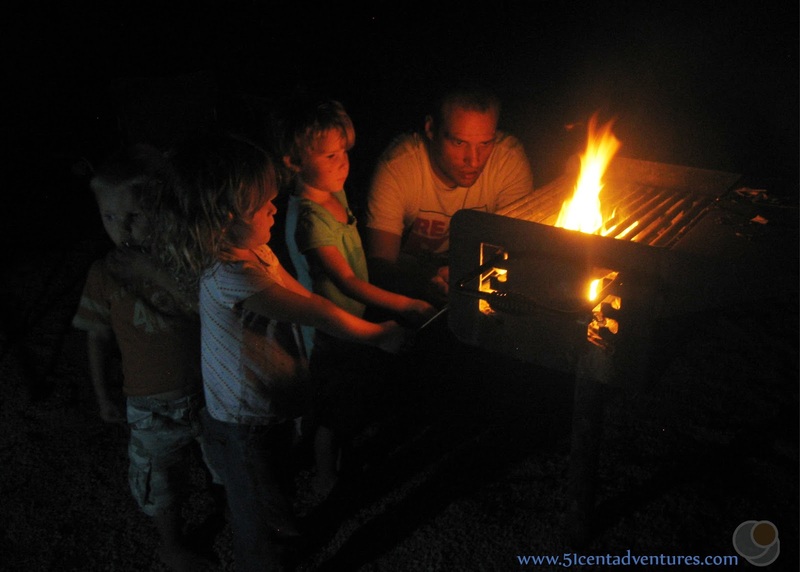 Camping starts at $12 for primitive sites and is $20 for sites with water and electricity. 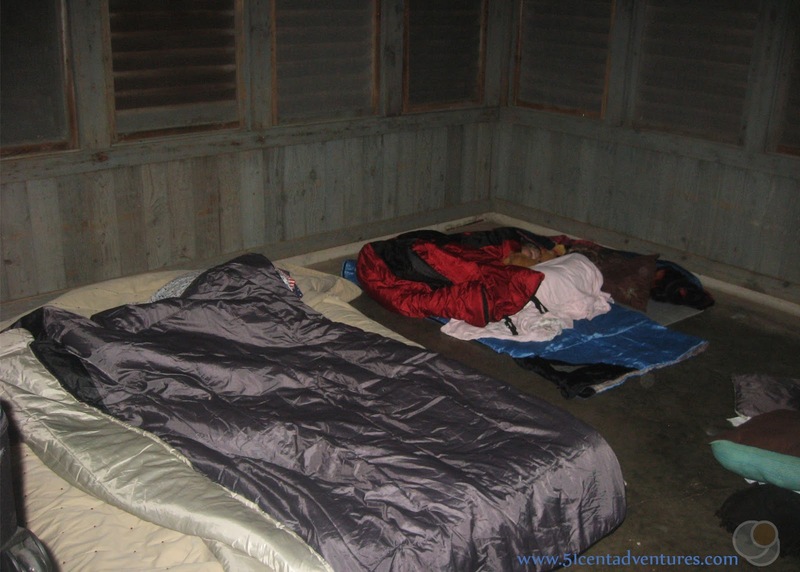 There are also screened sleeping shelters for $25 per night. Operating Seasons and Hours: Open daily throughout the year though the park does close to the general public during certain days during hunting seasons.. Park gates lock at 10:00 p.m. Visitor Center Hours are 8:00 a.m. to 4:30 p.m Sunday through Thursday and 8:00 a.m. to 9:30 p.m Friday and Saturday. Date of Visit: Tuesday, November 4, 2014 and Wednesday, November 5, 2015. This was the first stop on the fourth day of the Texas Coastline Road Trip that my husband and I took our kids on in November of 2014. 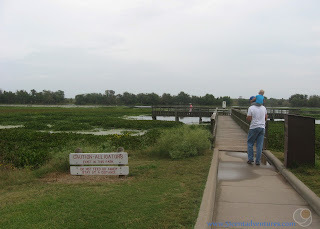 We drove away from Goose Island State Park and headed toward Brazos Bend State Park which was southwest of Houston, Texas. The trip would take us over two and a half hours. We ended up taking a little longer because we planned to stop in the town of Angleton for lunch and grocery shopping. Once we'd replenished our food supply we backtracked west to the park entrance. 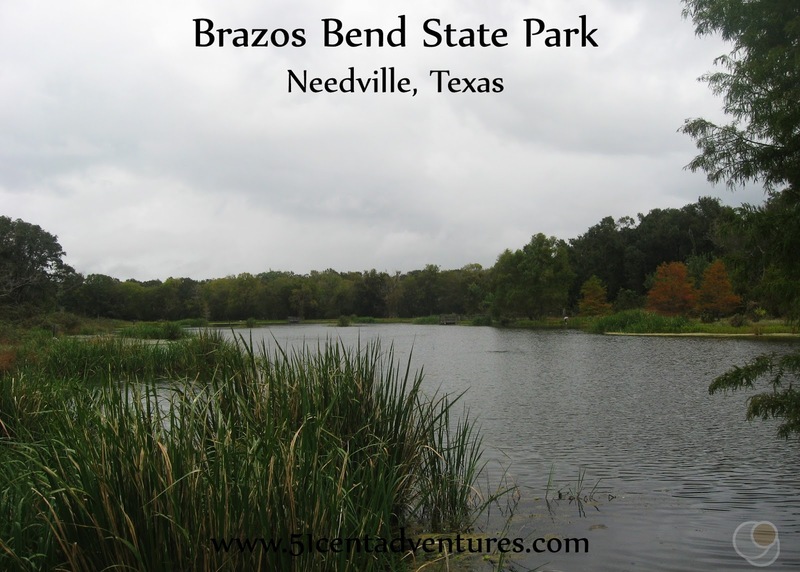 When I planned this vacation I added a stop at Brazos Bend State Park almost as an afterthought. Back when I'd planned our 2013 Roadtrip my sister told me that you could see alligators at a state park near Houston. That sounded cool, but I worried about taking three very small children to an area full of alligators. I put the park onto my mental "maybe later list" and didn't think about it again. 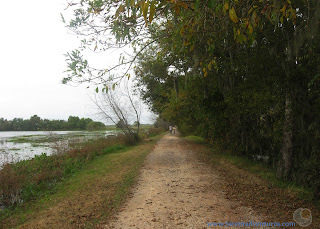 As I worked on planning this 2014 road trip I was interesting things to do in the Freeport, Texas area. Freeport was on the coast between Corpus Christi and Galveston, and so it made sense as a good place to stop on our fourth day of our beach themed roadtrip. However, nothing I read about the area caught my interest . I'm not saying that there wasn't anything to do there, but most of the things that were available were things that we'd already experienced in the first three days of our trip. 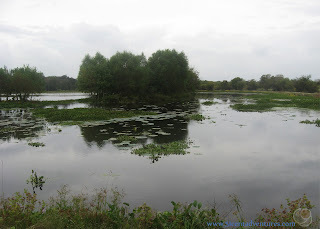 I remembered Brazos Bend and those alligators so I decided that would be a good place to visit. Plus it had a good campground so that meant we could stay there. I booked a place to camp and added the park to our itinerary. I didn't do any other research on the park. I assumed it would just be a place to stay, see a few alligators, and then we'd be on our way. I'd even penciled in a trip to the Houston Zoo in case we got done with the state park too quickly. Boy, was I in for a surprise. The first thing that I noticed about the park was how big it was. The roads inside the park just seemed to keep going and going. The second thing I noticed were the trees. These were unlike any trees I'd seen in Texas so far. They were dense and covered with Spanish Moss. I was excited about the place we were going to stay that night. When I reserved our place to stay, I'd decided to pay a little bit extra and reserve a structure rather than just a tent campsite. I figured we would like a break from setting up the tent. Plus I was a little worried about those allegators. (I figured they wouldn't be allowed near our campsite, but I didn't want to take any chances.) It was very nice to pull up and have a place ready and waiting for us. We were able to pick which ever structure we wanted. We decided on one that had a playground behind it. My kids were all very excited about having a place to play. My husband was thrilled too. He went down the slide, and then turned to me with a big smile on his face and said, "I'm so glad we came here." I was happy we were there too. The place was absolutely gorgeous. There were Live Oaks with Spanish Moss hanging from their branches. The grass was green and neatly trimmed. It reminded me of the Uchee Creek Campground in Fort Benning, Georgia. My husband and I had stayed in a cabin there when he graduated from Basic Training. This state park definitely was the most "Southern" looking place I'd visited in Texas. The area next to the structure had a picnic table, a fire pit, and raised grill. My husband got a fire going, and the kids roasted marshmallows and ate graham crackers. We didn't do s'mores because they are just too sticky and too complicated for our little kids. There weren't any beds or other furniture inside the structure. But that was okay because we had our air mattress and foam mattresses. When I first saw the structure that we were going to sleep in I loved it, but I was also worried that it would have a lot of bugs inside. I tried not to think about how many spiders would crawl on us during the night. But there weren't any bugs or spiders. Instead there were squirrels that ran over the roof. The sound of their claws scrapping the roof was kind of unnerving at first, but we got used to it after a while. After the kids were in bed my husband and I took turns taking showers at the campground bathroom. We also discovered that the building had a little laundry room with two washers and dryers. That hadn't been advertised in the state park's brochure. If I'd known we could have done laundry at the park I would have brought a lot less clothes and more quarters. I had enough quarters to wash one load of laundry, but not to dry it. So I washed some clothes and my husband set up a clothes line for them to dry. The night wasn't hot, but it was humid enough that the clothes on the clothes line never really dried. The next morning we ate a quick breakfast, packed up, and then set out to explore the park. Based on what I'd seen so far I knew that we wouldn't have any time for that optional trip to the Houston Zoo. We decided to go check out one of the park's six lakes. We picked 40 Acre Lake because it had an observation tower at the half way point on the trail. First we went out on a little fishing pier. There were signs that advised us to be cautious of any alligators we saw. The area was gorgeous. 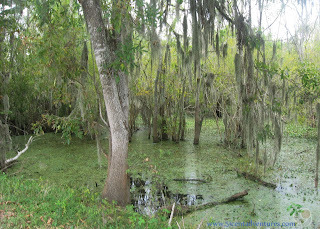 It was like a swamp-land paradise. I know that sounds like a contradiction, but it was true. The wetland really were beautiful. Part of me was hoping to see some alligators, but I was also kind of glad when we didn't see any in the water. The trail around the lake started out going through some woods. 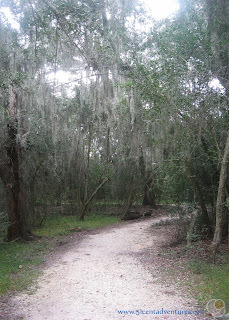 The trail was lined with trees that had Spanish moss hanging from their branches. It was so enchanting. Half way around the lake we came to the observation tower. 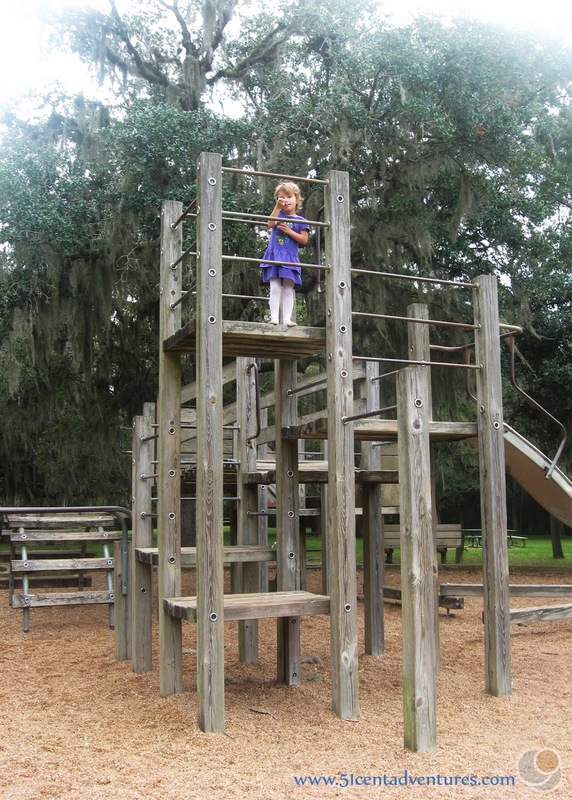 The kids loved climbing up the stairs and looking around at the panoramic view of nature. The trail around the lake was on a berm. The lake was on one side, and the other side was the wetland. The kids had been whining about how tired they were during the second half of the walk. 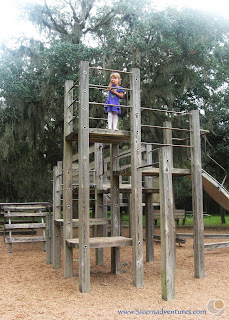 But that didn't stop them from playing on the playground when we made it back to the parking lot. After our walk we decided to check out the Nature Center. For such a large park it was in a rather small building. When we went inside we finally had a chance to see some alligators - baby ones. They were swimming inside a tank. My kids were all mesmerized by the alligators. The park rangers took one out and let my girls pet it. 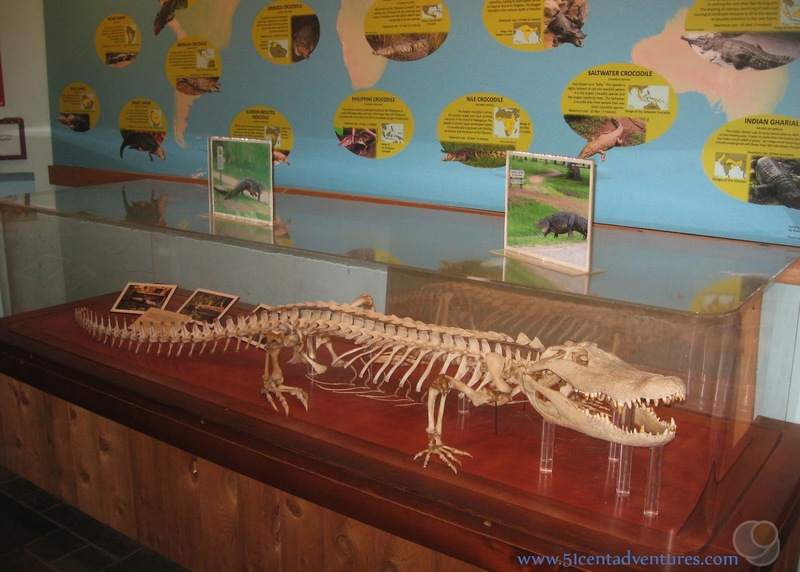 There were many displays inside the nature center. One of our favorite's was the touch table. There were things like turtle shells and animal skulls that we could pick up and look at. There was also this large skeleton of an alligator. One of the nice things about travelling in November is that there usually aren't any other families on vacation. There were hardly any other people in the Nature Center. 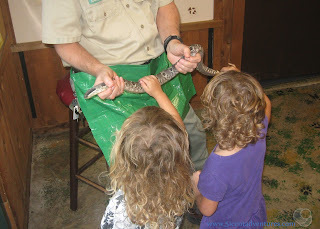 The rangers were really happy to show things off to my kids. 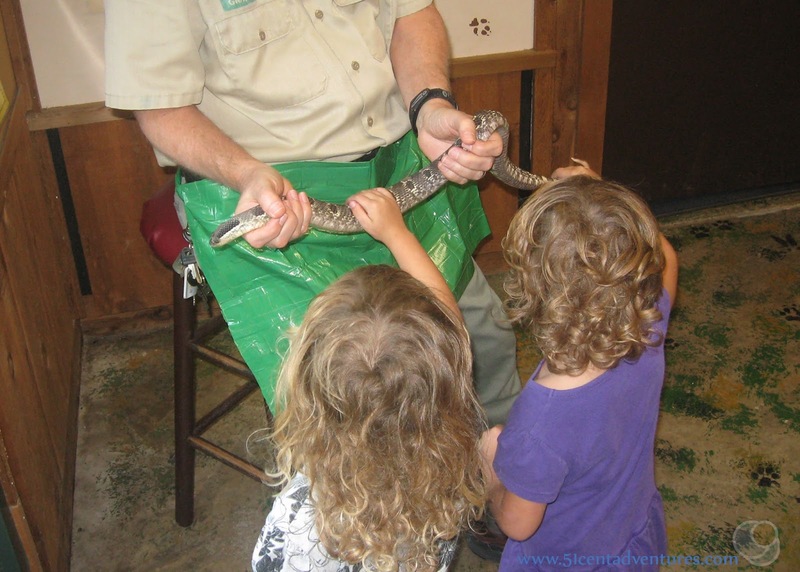 Another park ranger got a snake out for my twins to touch. The rangers commented that our girls weren't afraid of anything. I laughed and said, "Everything except seagulls." 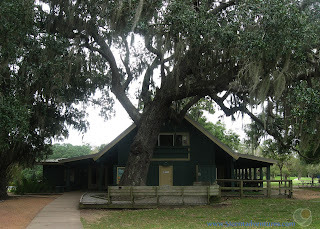 Even though the Nature Center was small we stayed there for a long time. Eventually though it was getting to be the kids naptime so that meant it was time for us to be on our way. I had one final thing I wanted to see though. 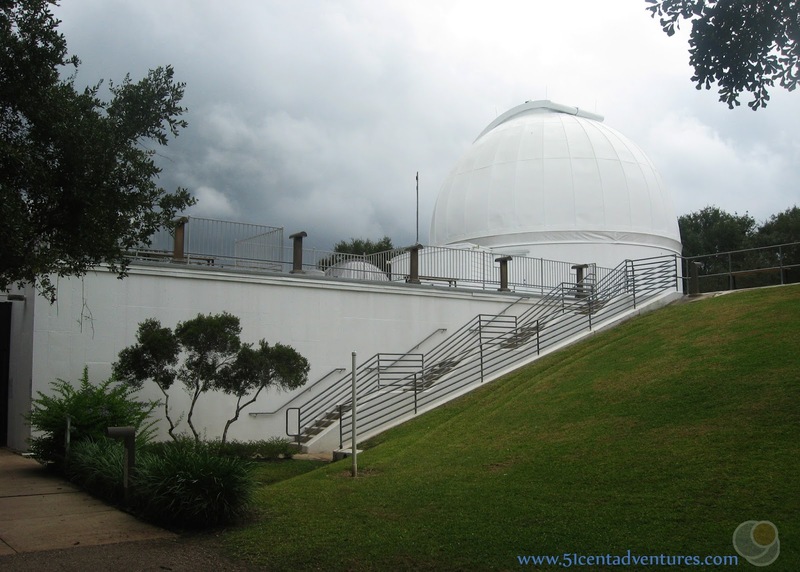 The George Observatory is located a short walk away from the Nature Center. I ran over to take a picture of the building while my husband helped the kids into the car. I would have taken all my kids to see it, but it's only open on Saturdays from 3:00 to 10:00. Throughout our visit to the park my husband and I kept turning to each other and saying things like, "this is the best vacation!" I'd always thought that our road trip around Southern Utah the summer before the twins were born was the Gold Standard as far as our vacations went. I'd always assumed that we wouldn't have another vacation that great until the kids were older. But so far this beach road trip was rivaling the Southern Utah trip. 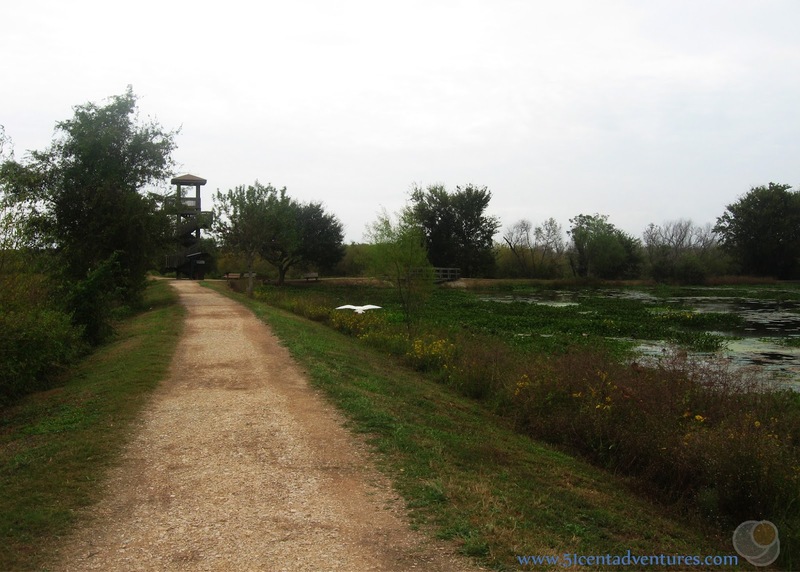 Part of what made the trip so great was how unexpectedly spectacular Brazos Bend State Park had turned out to be. Recommendation: Brazos Bend State Park is one of the most popular state parks in Texas. After a visit to the park it's easy to see why. This park is a great place to visit to see lots of nature. I look forward to visiting this park again one day. Directions: Because it is so near to Houston, there are many roads that will take you to Brazos Bend State Park. The most direct way is to take Texas Highway 288 South from Houston to FM 1462. 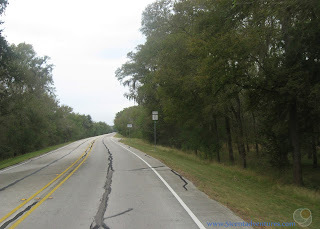 Go East on FM 1462 until you reach FM 762. Turn right on 762 and go about half a mile. The park entrance will be on your right. 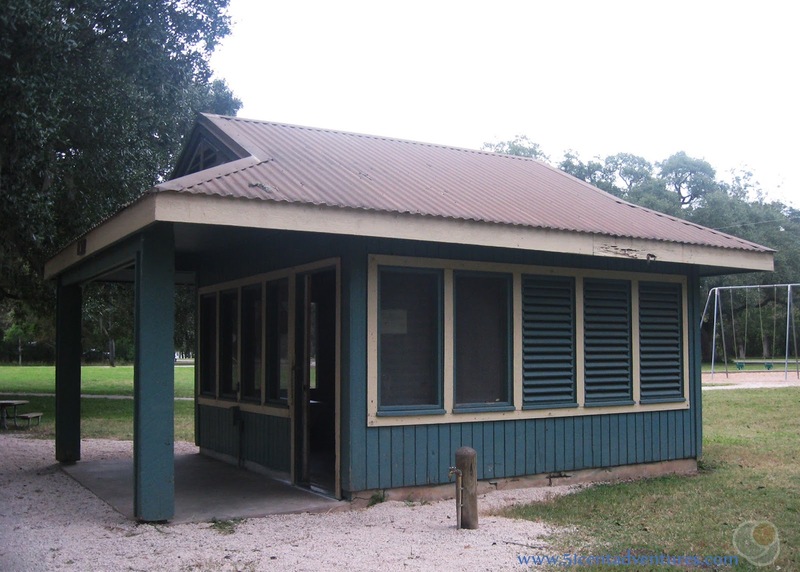 Additional Information: Brazos Bend State Park was not spared during the heavy rains and subsequent flooding in the Houston region during May and June of 2015. As much as 70% of the park ended up underwater - including the campgrounds. 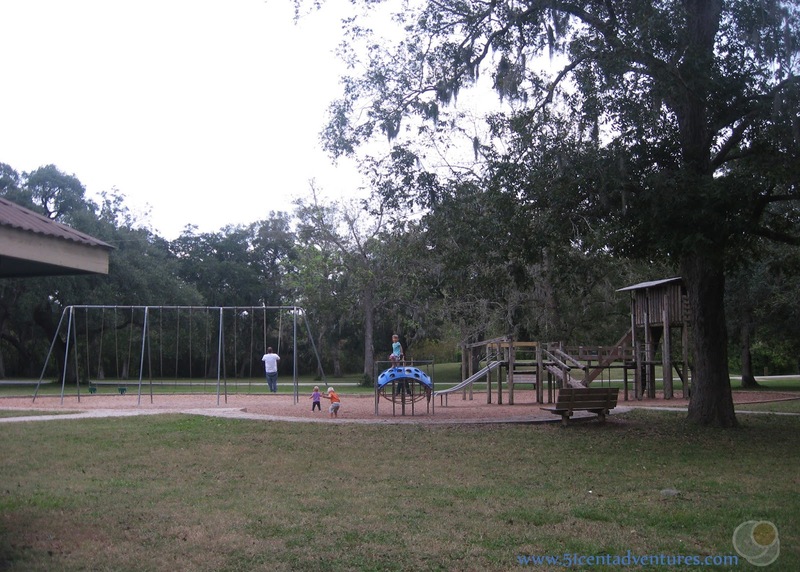 The Houston Chronicle wrote about the flood water's impact on the park. The park was able to reopen in July. 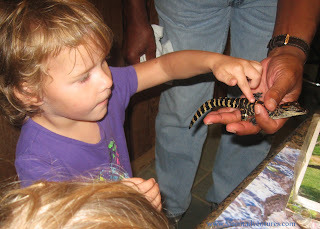 Places Nearby: If we had gone to Freeport, Texas we probably would have visited the Brazoria National Wildlife Refuge. This free area is home to many wildlife and so it would have been similar to Brazos Bend. We probably would also have visited one of the three beaches in the Freeport area. Bryan Beach is the one that stands out to me because you can camp and drive on the beach for free, but I'm sure that Surfside Beach and Quintana Beach are great options as well.